What are the requirements to join? We need people who enjoy working with others and have some time to share with the community. Our squad operates on a basic level, so the minimum training is Emergency Medical Technician - Basic (EMT/B). No EMT training is required to be a driver, you only need to complete a CPR course and then be trained on our rig. What are the educational requirements? The initial Emergency Medical Technician - Basic coursework requires an American Heart Assoc. Healthcare Provider CPR card and consists of 120 hours at a system approved training site. This class is usually scheduled for two nights per week and includes lectures, hands on practice of skills and some clinical time. After completion of the course, you will also receive training and testing on our local protocols and medications. There is also the state or national test that must be passed to be licensed. A complete EMT definition is available here. What is necessary to make a call? The Delavan Ambulance Service is required to have a minimum crew of 2 EMTs to answer a call, three and maybe more are preferable. Presently, we have some individuals who operate at the DRIVER ONLY level. Our drivers are required, to have the same AHA healthcare provider CPR card as our EMT's, as well as some additional training. We also have the option to allow 1 EMT-B student to assist with transport as well. The average call usually lasts between 2 and 3 hours. This time starts from when we are paged out, and includes our response, patient contact, patient transport to the hospital, time at hospital, return trip back to town, and finally completing the paperwork and restocking the ambulance with supplies. What is the pay / How are you funded? 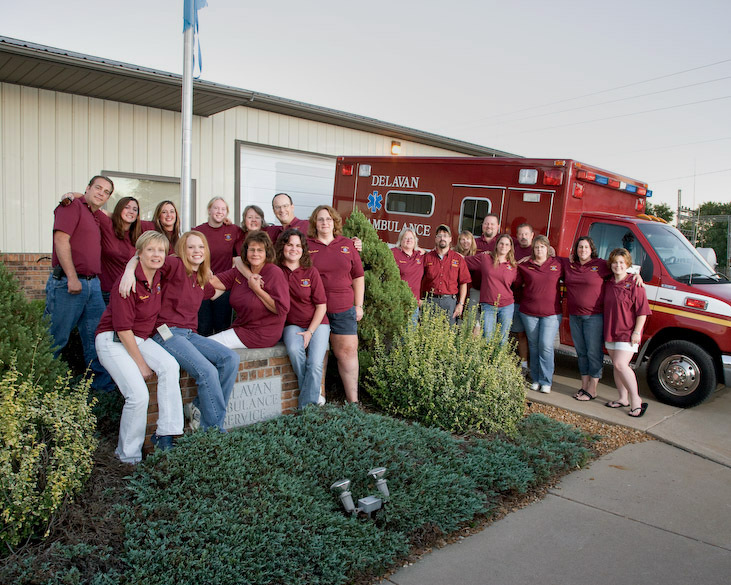 Each of the Delavan Ambulance Service members are solely volunteer. The Delavan Ambulance Service, is NOT tax supported (as is the Delavan Fire Dept). We do charge a modest fee fortransportation which covers supplies and training of the EMTs. We aremainly supported by memorials. With that being said,we do have our limits. For example, we do NOT providetransports to nursing homes or doctor appointments, etc. aswe do not have the man power to provide this service. We do,however, have a policy to help anyone interested in becoming an EMT-B and will share the cost of obtaining and maintaining this license. If interested, please call Chief Sean Bluhm, at 309-244-9312. How many volunteers do you have? From the beginning in 1976, we have averaged approximately, 15 to 30 EMT-Bs, and a few Drivers. We also have our Board of Directors which are also volunteers and average around 9 or 10 members. As you might guess, in this day and age, it has become increasingly difficult for people to find the time to volunteer, but the demands of our community has increased each year.. 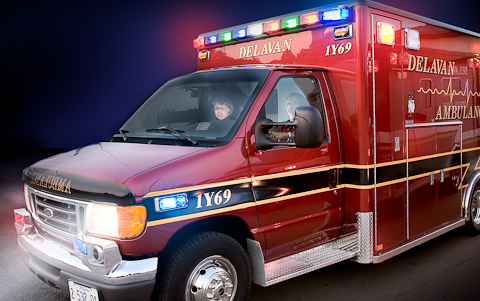 The Delavan Ambulance and the Delavan Fire Deptartment answered an average of 250 calls per year. This year, 2010, we are already on 285. How many people are needed for each call? We have to have a minimum crew of 2 people to take the ambulance out on a call. This may be 2 EMTs or 2 EMTs and a driver. On most calls additional personnel are very helpful and often needed. This is why many volunteers are needed. Sign me up! – how do I join? You can call and leave a message at our building, 244-7028. You can also come to a training meeting or contact any one of the members for further information. Training is 7 PMto 9 PM on the 2nd and 4th Monday of each month, except June, July, August and December when we meet only on the 2nd Monday.